For the assassination of Robert's brother, John, see Assassination of John F. Kennedy. On June 5, 1968, presidential candidate Robert F. Kennedy was mortally wounded shortly after midnight at the Ambassador Hotel in Los Angeles. Earlier that evening, the 42-year-old junior senator from New York was declared the winner in the South Dakota and California presidential primaries in the 1968 election. He was pronounced dead at 1:44 a.m. PDT on June 6, about 26 hours after he had been shot. Robert F. Kennedy lies mortally wounded on the floor immediately after the shooting. Kneeling beside him is 17-year-old busboy Juan Romero, who was shaking Kennedy's hand when Sirhan Sirhan fired the shots. Following dual victories in the California and South Dakota primary elections for the Democratic nomination for President of the United States, Senator Kennedy spoke to journalists and campaign workers at a live televised celebration from the stage of his headquarters at the Ambassador Hotel. Shortly after leaving the podium and exiting through a kitchen hallway, he was mortally wounded by multiple shots fired from a handgun. Kennedy died in the Good Samaritan Hospital 26 hours later. The shooter was 24-year-old Sirhan Sirhan. In 1969, Sirhan was convicted of murdering the senator and sentenced to death. His sentence was commuted to life in prison in 1972. A freelance newspaper reporter recorded the shooting on audio tape, and the aftermath was captured on film. Kennedy's remains were taken to St. Patrick's Cathedral, New York for two days of public viewing before a funeral Mass was held on June 8. His funeral train traveled from New York to Washington, D.C., and throngs of spectators lined the route to view the journey. His body was interred at night in Arlington National Cemetery near his brother John. His death prompted the United States Secret Service to protect presidential candidates. Vice President Hubert Humphrey was also a presidential candidate; he went on to win the Democratic nomination but ultimately lost the election to Republican candidate Richard Nixon. Much like his brother's assassination, Robert Kennedy's assassination has led to a number of conspiracy theories; to date, no credible evidence has emerged that Sirhan was not the shooter, or that he didn't act alone. Kennedy and Huey Long of Louisiana (in 1935) are the only two sitting United States Senators to be assassinated. Kennedy was 22 years old in 1948 when he visited the British Mandate of Palestine and wrote dispatches for The Boston Post about the trip and its effect on him. During his stay, he wrote that he grew to admire the Jewish inhabitants of the area, and he became a strong supporter and advocate for Israel when he became a Senator. Appointed United States Attorney General in December 1960 by his brother, President John Fitzgerald Kennedy, he served in that post from January 1961 until his resignation on September 3, 1964, in order to run for election to the United States Senate. Opposing incumbent Republican Kenneth Keating, his first attempt at elective office scored a tight race win in an otherwise landslide Democratic Party year. He took office as Senator from New York on January 3, 1965. The run-up to the 1968 presidential election under President Lyndon B. Johnson was a period of great social unrest. There were riots in major cities amid Johnson's attempts to introduce anti-poverty and anti-discrimination legislation, and there was significant opposition to the ongoing Vietnam War. The assassination of Martin Luther King Jr. on April 4, 1968, led to further riots in several cities. Kennedy entered the race for the Democratic Party's nomination for president on March 16, four days after Senator Eugene McCarthy received a large percentage of the vote in the New Hampshire primary against the incumbent President (42 percent to Johnson's 49 percent). Two weeks later, President Johnson announced that he was no longer seeking re-election, and Vice President Hubert Humphrey announced that he would seek the presidency a month later. Humphrey did not participate in any primaries, but he did obtain the support of many Democratic Party delegates. Following the California primary, Kennedy was in second place with 393 delegates compared to Humphrey's 561 and McCarthy's 258. The 1968 California presidential primary elections were held on Tuesday, June 4. The statewide results gave Kennedy 46 percent and McCarthy 42 percent. Four hours after the polls closed in California, Kennedy claimed victory in the state's Democratic presidential primary. He spoke by phone with South Dakota Senator George McGovern. At approximately 12:10 a.m. PDT on June 5, he addressed his campaign supporters in the Ambassador Hotel's Embassy Room ballroom in the Mid-Wilshire district of Los Angeles. At the time, the government provided Secret Service protection for an incumbent president, but not for presidential candidates. Kennedy's only security was provided by former FBI agent William Barry and two unofficial bodyguards: Olympic decathlon gold medalist Rafer Johnson and former football player Rosey Grier. Kennedy had welcomed contact with the public during the campaign, and people had often tried to touch him in their excitement. Kennedy planned to walk through the ballroom when he had finished speaking. He ended the speech by stating: "My thanks to all of you; and now it's on to Chicago, and let's win there!" He was on his way to another gathering of supporters elsewhere in the hotel. Reporters wanted a press conference, and campaign aide Fred Dutton decided that Kennedy would forgo the second gathering and instead go through the hotel's kitchen and pantry area behind the ballroom to the press area. Kennedy finished speaking and started to exit when William Barry stopped him and said, "No, it's been changed. We're going this way." Barry and Dutton began clearing a way for Kennedy to go left through swinging doors to the kitchen corridor, but Kennedy was hemmed in by the crowd and followed maître d'hôtel Karl Uecker through a back exit. Uecker led Kennedy through the kitchen area, holding his right wrist, but frequently releasing it as Kennedy shook hands with people whom he encountered. Uecker and Kennedy started down a passageway narrowed by an ice machine against the right wall and a steam table to the left. Kennedy turned to his left and shook hands with busboy Juan Romero, just as Sirhan Sirhan stepped down from a low tray-stacker beside the ice machine, rushed past Uecker, and repeatedly fired an eight-shot .22 Long Rifle caliber Iver Johnson Cadet 55-A revolver. Kennedy fell to the floor, and bodyguard William Barry hit Sirhan twice in the face while others, including writer George Plimpton, forced him against the steam table and disarmed him, as he continued firing his gun in random directions. Five other people were wounded in addition to Kennedy: William Weisel of ABC News, Paul Schrade of the United Automobile Workers union, Democratic Party activist Elizabeth Evans, Ira Goldstein of the Continental News Service, and Kennedy campaign volunteer Irwin Stroll. After a minute, Sirhan wrestled free and grabbed the revolver again, but he had already fired all the bullets and was subdued. Barry went to Kennedy and placed his jacket under the candidate's head, later recalling: "I knew immediately it was a .22, a small caliber, so I hoped it wouldn't be so bad, but then I saw the hole in the Senator's head, and I knew". Reporters and photographers rushed into the area from both directions, contributing to the confusion and chaos. As Kennedy lay wounded, Juan Romero cradled his head and placed a rosary in his hand. Kennedy asked Romero, "Is everybody OK?" and Romero responded, "Yes, everybody's OK." Kennedy then turned away and said, "Everything's going to be OK." This moment was captured by Life photographer Bill Eppridge and Boris Yaro of the Los Angeles Times and became the iconic image of the assassination. There was some initial confusion concerning who was shot, one witness believing that the primary victim was Kennedy's campaign manager and brother-in-law Stephen Edward Smith. Another witness stated that a female in a polka-dot dress had exclaimed repeatedly, "We killed him," before running away. Video footage of her testimony can be seen in the Netflix series "Bobby Kennedy for President". Kennedy's wife Ethel was three months pregnant; she stood outside the crush of people at the scene seeking help. She was soon led to her husband and knelt beside him. He turned his head and seemed to recognize her. Smith promptly appeared on television and calmly asked for a doctor. Friend and journalist Pete Hamill recalled that Kennedy had "a kind of sweet accepting smile on his face, as if he knew it would all end this way". After several minutes, medical attendants arrived and lifted Kennedy onto a stretcher, prompting him to whisper, "Don't lift me", which were his last words, as he lost consciousness shortly after. He was taken a mile away to Central Receiving Hospital, where he arrived near death. One doctor slapped his face, calling, "Bob, Bob", while another doctor manually massaged his heart. After obtaining a good heartbeat, doctors handed a stethoscope to Ethel so that she could hear his heart beating. After about 30 minutes, Kennedy was transferred several blocks to the Hospital of the Good Samaritan to undergo surgery. A gymnasium near the hospital was set up as temporary headquarters for the press and news media to receive updates on his condition. Surgery began at 3:12 a.m. and lasted three hours and 40 minutes. At 5:30 p.m. on Wednesday, spokesman Frank Mankiewicz announced that Kennedy's doctors were "concerned over his continuing failure to show improvement"; his condition remained "extremely critical as to life". Kennedy had been shot three times. One bullet was fired at a range of perhaps 1 inch (3 cm) and entered behind his right ear, dispersing fragments throughout his brain. The other two entered at the rear of his right armpit; one exited from his chest and the other lodged in the back of his neck. Despite extensive neurosurgery to remove the bullet and bone fragments from his brain, he was pronounced dead at 1:44 a.m. on June 6, nearly 26 hours after the shooting. I have a short announcement to read, which I will read at this time. Senator Robert Francis Kennedy died at 1:44 a.m., June 6, 1968. With Senator Kennedy at the time of his death were his wife Ethel, his sisters Mrs. Stephen Smith, Mrs. Patricia Lawford, his brother-in-law Mr. Stephen Smith and his sister-in-law Mrs. John F. Kennedy. He was 42 years old. Thank you. Sirhan Sirhan (born March 19, 1944) is a Palestinian Arab with Jordanian citizenship, born in Jerusalem, who held strongly anti-Zionist beliefs. A diary was found during a search of his home, and he wrote on May 19: "My determination to eliminate RFK is becoming more and more of an unshakable obsession. RFK must die. RFK must be killed. Robert F. Kennedy must be assassinated.... Robert F. Kennedy must be assassinated before 5 June 68." It has been suggested that the date of the assassination is significant because it was the first anniversary of the start of the Six-Day War between Israel and its Arab neighbors. When Sirhan was booked by police, they found a newspaper article in his pocket that discussed Kennedy's support for Israel; Sirhan testified at his trial that he began to hate Kennedy after learning of this support. In 1989, he told David Frost in prison: "My only connection with Robert Kennedy was his sole support of Israel and his deliberate attempt to send those 50 bombers to Israel to obviously do harm to the Palestinians". Some scholars view the assassination as one of the first major incidents of political violence in the United States stemming from the Arab–Israeli conflict in the Middle East. The interpretation that Sirhan was motivated by Middle Eastern politics has been criticized as an oversimplification which ignores his psychological problems. Sirhan's lawyers attempted to use a defense of diminished responsibility during the trial, while Sirhan himself tried to confess to the crime and change his plea to guilty on several occasions. He testified that he had killed Kennedy "with 20 years of malice aforethought". The judge did not accept this confession and it was later withdrawn. Sirhan was convicted of the murder of Robert Kennedy on April 17, 1969, and was sentenced six days later, to death. In 1972, the sentence was commuted to life in prison with the possibility of parole after the California Supreme Court invalidated all pending death sentences that were imposed prior to 1972, due to its ruling in California v. Anderson. Since that time, Sirhan has been denied parole 15 times and is currently confined at the Richard J. Donovan Correctional Facility in southern San Diego County. His lawyers have claimed that he was framed, and he claims to have no memory of his crime. The Iver Johnson .22 caliber revolver that Sirhan Sirhan used to assassinate Robert F. Kennedy originated from Albert Leslie Hertz, a resident of Alhambra just south of Pasadena, California. He originally bought the gun to protect his own business during the 1965 Watts riots, but never used it and kept it in its original wrapping paper and box. Hertz's wife decided the gun was too dangerous and gave it to her daughter, Dana Westlake. Westlake didn't use it and gave the gun to her next-door neighbor, George Erhard. Erhard later sold the gun to Sirhan Sirhan's brother, Munir Bishara Sirhan, known as "Joe", who George knew was working at Nash's department store at the corner of Arroyo and Colorado in Pasadena. At the time, Erhard was looking to seek more money from the gun sale to finance some work on his car. On June 25, 1968, a polygraph examination was administered to Munir Sirhan to determine his truthfulness regarding the gun and whether or not Ernard had ever been in the Sirhan home. Munir Sirhan's responses to questions indicated he was being untruthful. . . . Munir . . . admitted that he was lying when he said Erhard had been inside his home. . . .He corrected himself and stated he had asked Erhard if he had any guns for sale and that eventually Erhard showed him the .22-caliber revolver. He examined the gun in the parking lot of Nash's Department Store. . . . After examining the gun, he told Erhard he did not have sufficient money to purchase the gun at that time. He asked Erhard to bring the gun to the corner of El Molino and Howard Streets in Pasadena later that evening and told him that he would have the money to purchase the gun. Munir stated that he and Sirhan were together when Erhard came to deliver the gun. Munir Sirhan then stated that Sirhan Sirhan had been the one who bought the gun. Munir was again informed that the polygraph test showed that he had actually purchased the gun. Munir Sirhan refused to change his story. It is likely that Munir and Sirhan purchased the gun in such a clandestine manner because they were both aware that it was unlawful for aliens to own handguns. Sirhan first shot the gun in March 1968 and practiced with it about a half dozen times between March and May 1968. He said he "liked guns."' Munir said Sirhan kept the gun in the glove compartment of his De Soto. Munir often heard Sirhan playing with something that made a "click, click" sound, and he believed it was the gun." Munir had been "frightened" by the look in Sirhan's eye when his brother handled the gun. In fact Munir was so worried he made Sirhan swear on their dead sister, Aida, that he would not use the gun in a "bad" way. Sirhan had violated three California laws merely by possessing the pistol he used to kill Robert Kennedy. Thus, if Sirhan were simply an unwitting patsy involved in a conspiracy, the conspirators must have knowingly chosen a man who had been risking the whole conspiratorial venture by possessing an illegal weapon and firing it at a police range. Had Sirhan been caught with the illegal weapon, the purported conspiracy would have collapsed. At the time of the shooting, NBC and ABC News were signing off from their electoral broadcasts, while the CBS coverage had already concluded. CBS coverage began 21 minutes after the shooting with Joseph Benti, then preparing his anchoring duties for The CBS Morning News, from the election studio at the CBS Broadcast Center in New York; Walter Cronkite joined him a half hour later. Mike Wallace had co-anchored the primary election coverage with Cronkite and Benti, and he appeared briefly after the shooting. CBS reporters Terry Drinkwater and David Schumacher delivered on-camera updates and interviews from the Ambassador; colleagues Roger Mudd and John Hart phoned in reports to New York. Later, Mudd presented on-camera updates on Kennedy's condition from Good Samaritan Hospital. At ABC, Howard K. Smith signed off and the closing billboard aired followed by a wide studio shot of Smith, co-anchor Bill Lawrence, and staff with the graphic "Race to the White House: California Primary" on screen (accompanied by the John Philip Sousa march The Thunderer as theme music). When the theme completed, after a moment of silence and a "please stand by" announcement, a portion of the theme was played again. Announcer Carl Caruso then alerted viewers to "please stand by for a special report," with the wide shot and graphic still on air, as the theme played a third time. During the long static shot, the ABC camera captured live the panic and bewilderment in the New York studio. Two and a half minutes more passed before Smith returned to air to say, "Ladies and gentlemen, we have kept the air on because we have heard an alarming report that Robert Kennedy was shot in that ballroom at the Ambassador Hotel in Los Angeles." Smith would clarify that word was received about the sound of gunfire a short time earlier, but they had waited to receive additional confirmation about what happened before making any announcements. Meanwhile, the ABC reporters at the Ambassador crowded into the kitchen where Kennedy had been shot and the immediate aftermath was captured only by audio recording and cameras that had no live transmission capability. ABC was able to show scant live footage from the kitchen after Kennedy had been transported, but all of ABC's coverage from the Ambassador was in black and white. One of the ABC reporters at the Ambassador was Bob Clark, who had also reported from Dallas on the assassination of John F. Kennedy. Clark and Marlene Sanders later reported from Good Samaritan Hospital. At about 7:00 a.m. EST, Frank Reynolds joined Smith at the New York anchor desk. Sam Donaldson contributed reports from the ABC bureau in Washington. NBC was also about to sign off in New York when anchor Frank McGee received a telephone call on camera, apparently informing him of the shooting. A visibly stunned McGee spent the next few minutes filling time until he was ready to inform viewers that Kennedy had been shot. NBC reporter Charles Quinn was one of the first to report from the scene of the shooting, telling viewers, "He's lying here on the floor. Senator Kennedy has been shot. He's been shot. There's blood on the floor." Quinn and colleague Lew Allison gave updates and conducted interviews from the hotel ballroom and lobby; Sander Vanocur reported from a temporary studio in the hotel, interviewing eyewitnesses and others involved in events surrounding the shooting. NBC anchors Chet Huntley and David Brinkley had co-anchored the primary coverage with McGee, and they returned to the Burbank anchor desk at about 4:15 a.m. EST. Jack Perkins reported for NBC from Good Samaritan Hospital. CBS and NBC shot footage in the kitchen of the shooting's aftermath on color film, which could not be broadcast until it was developed two hours after the incident. Mutual News was among the first to broadcast a report from the assassination location, because reporter Andrew West of KRKD, a Mutual Broadcasting System radio affiliate in Los Angeles, captured on audio tape the sounds of the immediate aftermath of the shooting but not the actual shooting itself, using his reel-to-reel tape recorder and attached microphone. He had just recorded Kennedy's victory speech from the podium, and he followed Kennedy and his entourage to the kitchen pantry. West turned his recorder on again seconds after Kennedy was shot and started reporting the developments. Several seconds later, West gave an on-the-spot account of the struggle with Sirhan in the hotel kitchen pantry, shouting at Rafer Johnson to "Get the gun, Rafer, get the gun!" and telling others to "get a hold of his thumb and break it, if you have to! Get his thumb! Hold him, hold him! We don't want another Oswald!". Reporter West finished his audio recording, went to a telephone, connected his tape recorder, and called Mutual West in San Francisco, co-located with radio stations KKHI-AM-FM. Producer John Hawkins had shut down KKHI/Mutual West operations at Midnight and was heading out the door, but answered the unexpected call. Hawkins recalls West screaming "roll a tape, Kennedy's been shot, roll a tape." Hawkins recorded as West spoke a live introduction then played his tape. Hawkins sent the complete recording to Mutual's New York headquarters over a dedicated line. Soon after, Mutual News broadcast Andrew West's dramatic report to all radio stations which were monitoring for Mutual News bulletins overnight. As additional Mutual News stations returned to the air or resumed newscasts (often at 6:00AM) West's report was widely broadcast, and picked up by other stations and networks. KKHI radio could have been the first to broadcast West's report just after Midnight, but it was already off the air until 6:00AM (KKHI-AM-FM were classical music stations). Los Angeles CBS radio affiliate KNX (AM) interrupted its rundown of local primary returns to provide coverage of the shooting. KNX also simulcast coverage from KNXT-TV (now KCBS-TV) with anchor Jerry Dunphy, which was also fed nationwide on the CBS Radio Network in the initial hours after the shooting. Over the following week, NBC devoted 55 hours to the shooting and aftermath, ABC 43, and CBS 42, with all three networks preempting their regular coverage and advertisements to cover the story. As with the 1963 assassination of his brother, President John F. Kennedy, Robert Kennedy's death has been the subject of widespread analysis. Some individuals involved in the original investigation and some researchers have suggested alternative scenarios for the crime, or have argued that there are serious problems with the official case. In November 2006, the BBC's Newsnight program presented research by filmmaker Shane O'Sullivan alleging that several CIA officers were present on the night of the assassination. Three men who appear in films and photographs from the night of the assassination were positively identified by former colleagues and associates as former senior CIA officers who had worked together in 1963 at JMWAVE, the CIA's main anti-Castro station based in Miami. They were JMWAVE Chief of Operations David Morales, Chief of Maritime Operations Gordon Campbell and Chief of Psychological Warfare Operations George Joannides. However, several people who had known Morales, including family members, were adamant that he was not the man who O'Sullivan said was Morales. After O'Sullivan published his book, assassination researchers Jefferson Morley and David Talbot also discovered that Campbell had died of a heart attack in 1962, six years prior to the assassination of Kennedy. In response, O'Sullivan stated that the man on the video may have used Campbell's name as an alias. He then took his identifications to the Los Angeles Police Department whose files showed the men he identified as Campbell and Joannides to be Michael Roman and Frank Owens, two Bulova sales managers attending the company's convention in the Ambassador. O'Sullivan stood by his allegations stating that the Bulova watch company was a "well-known CIA cover". The location of Kennedy's wounds suggested that his assailant had stood behind him, because some witnesses assert that Sirhan faced west as Kennedy moved through the pantry facing east. This has led to the suggestion that a second gunman actually fired the fatal shot, a possibility supported by Chief Medical Examiner and Coroner for the County of Los Angeles Thomas Noguchi who stated that the fatal shot was behind Kennedy's right ear and had been fired at a distance of approximately one inch. Other witnesses, though, said that Kennedy was turning to his left shaking hands as Sirhan approached, facing north and so exposing his right side. During a re-examination of the case in 1975, the U.S. Supreme Court ordered expert examination of the possibility of a second gun having been used, and the conclusion of the experts was that there was little or no evidence to support this theory. As recently as 2008, eyewitness John Pilger asserted his belief that there must have been a second gunman. In 2007, it was revealed that forensic expert Philip Van Praag had analyzed an audiotape of the shooting known as the Pruszynski recording in which Van Praag had discovered acoustic evidence that a second gun had been involved in the assassination. Van Praag found that 13 shots were fired even though Sirhan's gun held only eight rounds, its maximum bullet capacity, and Sirhan had no opportunity to reload it. Van Praag states the recording also reveals at least two cases where the timing between shots was shorter than physically possible from Sirhan's gun alone. Forensic audio specialists Wes Dooley and Paul Pegas of Audio Engineering Associates in Pasadena examined Van Praag's findings and corroborated the presence of more than eight gunshots on the tape along with over-lapping shots, all of this indicating the presence of a second shooter. Similar corroboration came from forensic audio and ballistics expert Eddy B. Brixen in Copenhagen and audio specialist Phil Spencer Whitehead of the Georgia Institute of Technology in Atlanta. Other acoustic experts, however, have claimed that they could find no more than eight shots recorded on the audiotape. The Pruszynski recording was uncovered in 2004 by CNN's Brad Johnson; its existence had been unknown to the general public previously. On February 22, 2012, Sirhan's lawyers William Francis Pepper and Laurie Dusek filed a court brief in U.S. District Court in Los Angeles claiming that a second gunman fired the shots that killed Kennedy. It was the fourth and final in a series of federal briefs filed under the writ of habeas corpus by Pepper and Dusek beginning in October 2010. Judge Beverly Reid O'Connell denied the petition in 2015. Following Kennedy's autopsy on June 6, his remains were taken to Manhattan, where his closed casket was viewed by thousands at St. Patrick's Cathedral. The funeral mass was held on the morning of June 8. My brother need not be idealized, or enlarged in death beyond what he was in life; to be remembered simply as a good and decent man, who saw wrong and tried to right it, saw suffering and tried to heal it, saw war and tried to stop it. Those of us who loved him and who take him to his rest today, pray that what he was to us and what he wished for others will someday come to pass for all the world. As he said many times, in many parts of this nation, to those he touched and who sought to touch him: "Some men see things as they are and say why. I dream things that never were and say why not." Immediately following the mass, Kennedy's body was transported by a slow-moving train to Washington, D.C., and thousands of mourners lined the tracks and stations, paying their respects as the train passed by. On the way to the cemetery, the funeral procession passed through Resurrection City, a shantytown protest set up as part of the Poor People's Campaign. The procession stopped in front of the Lincoln Memorial, where residents of Resurrection City joined the group and sang "The Battle Hymn of the Republic". 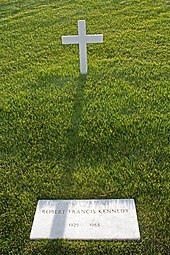 Kennedy was buried near his older brother John, in Arlington National Cemetery, in the first burial to have ever taken place there at night; the second was the burial of his younger brother Ted in 2009. After Kennedy's assassination, Congress altered the Secret Service's mandate to include protection for presidential candidates. The remaining candidates were immediately protected under an executive order issued by Lyndon Johnson, putting a strain on the poorly resourced Secret Service. At the time of his death, Kennedy was substantially behind Humphrey in convention delegate support, but many believe that Kennedy would have ultimately secured the nomination following his victory in the California primary. Only thirteen states held primaries that year, meaning that most delegates at the Democratic convention could choose a candidate based on their personal preference. Historian Arthur M. Schlesinger Jr., and others have argued that Kennedy's broad appeal and charisma would have been sufficiently convincing at the 1968 Democratic National Convention to give him the nomination. Historian Michael Beschloss believed that Kennedy would not have secured the nomination. Humphrey, after a National Convention in Chicago marred by violence in the streets, was far behind in opinion polls but gained ground. He ultimately lost the general election to Republican Richard Nixon by the narrow popular vote margin of 43.4 percent to 42.7 percent. Nixon won by a more decisive 301–191 margin in the electoral vote. Kennedy's assassination was a blow to the optimism for a brighter future that his campaign brought for many Americans who lived through the turbulent 1960s. Juan Romero, the busboy who shook hands with Kennedy right before he was shot, later said, "It made me realize that no matter how much hope you have it can be taken away in a second." Now I realized what makes our generation unique, what defines us apart from those who came before the hopeful winter of 1961, and those who came after the murderous spring of 1968. We are the first generation that learned from experience, in our innocent twenties, that things were not really getting better, that we shall not overcome. We felt, by the time we reached thirty, that we had already glimpsed the most compassionate leaders our nation could produce, and they had all been assassinated. And from this time forward, things would get worse: our best political leaders were part of memory now, not hope. The stone was at the bottom of the hill and we were all alone. Kennedy's blood-stained shirt, tie and jacket are now in the possession of the Los Angeles County District Attorney. Controversy arose in 2010, when Kennedy's clothing was transported to the California Homicide Investigators Association conference in Las Vegas, where they were included in a temporary public display of never-before-seen artifacts from crime scenes related to prolific serial killers and infamous murders, such as the Black Dahlia murder and the killing of Hollywood actress Sharon Tate. The items and Kennedy's clothing were subsequently removed from the exhibit, with the LAPD apologizing to the Kennedy family. Until 1987, the LAPD retained the original files, reports, transcripts, fragments of the bullets that struck Kennedy and the four other bystanders in the kitchen pantry, the .22 caliber Iver-Johnson handgun used by Sirhan, Kennedy's blood-stained clothes and other artifacts related to the assassination. In 1987, the LAPD donated the entire evidence collection (except for Kennedy's clothes) to the California State Archives in Sacramento for permanent preservation. The Robert F. Kennedy Assassination Archives of the University of Massachusetts Dartmouth (known as the Southeastern Massachusetts University prior to 1991) also contain a large collection of materials on the assassination, located at the Claire T. Carney University Library. ^ "A busboy kneels again next to RFK". Los Angeles Times. ^ Thomas, Evan (2002). Robert Kennedy: His Life. Simon and Schuster. p. 392. ISBN 978-0-7432-0329-6. ^ Martinez, Michael (April 30, 2012). "RFK assassination witness tells CNN: There was a second shooter". CNN. ^ British Pathé. "Robert Kennedy Funeral (1969)". YouTube. Retrieved December 16, 2018. ^ British Pathé. "Funeral Of Robert Kennedy (1969)". YouTube. ^ Fischbach, Michael R. (June 2, 2003). "First Shot in Terror War Killed RFK". Los Angeles Times. Retrieved March 12, 2010. ^ Ben-David, Lenny (April 4, 2008). "This Kennedy was our friend". Jerusalem Post. Retrieved March 9, 2010. ^ "Kennedy, Robert Francis — Biographical information". Biographical Directory of the United States Congress. Archived from the original on July 30, 2008. Retrieved July 26, 2008. ^ "1964: Election triumph for Lyndon B Johnson". On this Day: 3 November. BBC. 2005. Archived from the original on April 8, 2008. Retrieved April 24, 2008. ^ "Biography of Lyndon B. Johnson". White House. Archived from the original on April 9, 2008. Retrieved April 24, 2008. ^ "1968: Martin Luther King shot dead". On this Day: 4 April. BBC. 2006. Retrieved September 17, 2006. ^ "A timeline of Sen. Eugene McCarthy's life and political career". Minnesota Public Radio. December 10, 2005. Archived from the original on September 7, 2008. Retrieved July 25, 2008. ^ "RFK LAPD Microfilm, Volume 75 (SUS Final Report)". Mary Ferrell Foundation. Retrieved July 25, 2008. ^ Wamsley, Laurel (October 4, 2018). "Juan Romero, Busboy Who Cradled Dying RFK, Dies At 68". NPR. Retrieved October 5, 2018. ^ a b c "A Life On The Way To Death". TIME. June 14, 1968. Archived from the original on May 1, 2008. Retrieved April 27, 2008. ^ Lopez, Steve (June 8, 1998). "Guarding the Dream". TIME. Archived from the original on September 30, 2007. Retrieved August 16, 2007. ^ a b c "Bobby's Last, Longest Day" (PDF). Newsweek: 29–30. June 17, 1968. ^ "The busboy who cradled a dying RFK has finally stepped out of the past". Archived from the original on August 24, 2016. ^ "Assassination of presidential hopeful Robert F. Kennedy" (Picture). National Museum of American History. 2007. Archived from the original on June 8, 2008. Retrieved May 14, 2008. ^ "NikonNet and 'Legends Behind the Lens' Honor the Iconic Works of Photojournalist Bill Eppridge". NikonUSA. February 4, 2004. Archived from the original on March 25, 2004. Retrieved March 29, 2012. ^ Reynolds, Christopher (January 5, 2007). "Double exposure of history and art, in a shutter's click". Los Angeles Times. Retrieved August 1, 2008. ^ Newfield, Jack (1988). Robert Kennedy: A Memoir (reprint ed.). New York: Penguin Group. pp. 299–300. ISBN 0-452-26064-7. ^ Hamill, Pete (May 18, 2008). "June 5, 1968: The Last Hours of RFK". NYMag.com. Retrieved June 17, 2017. ^ a b "Everything Was Not Enough". TIME. June 14, 1968. Retrieved April 27, 2008. ^ "The Man Who Loved Kennedy". TIME. February 21, 1969. Retrieved April 27, 2008. ^ Huntley, Chet (June 6, 1968). "The Death of Robert F. Kennedy". NBC Nightly News. NBC Learn, NBC News Archives, NBCUniversal Media, LLC. Retrieved July 3, 2012. ^ a b "Behind Steel Doors". Time. January 17, 1969. Retrieved April 27, 2008. ^ "Selectivity In Los Angeles". Time. January 31, 1969. Retrieved April 27, 2008. ^ Coleman, Loren (2004). The Copycat Effect: How the Media and Popular Culture Trigger the Mayhem in Tomorrow's Headlines. New York: Paraview Pocket. ISBN 978-0-7434-8223-3. ^ "Sirhan Felt Betrayed by Kennedy". The New York Times. Associated Press. February 20, 1989. Retrieved October 20, 2013. ^ "RFK's death now viewed as first case of Mideast violence exported to U.S." San Diego Union Tribune (Boston Globe). June 8, 2008. ^ Clarke, James W. (January 1981). "American Assassins: An Alternative Typology". British Journal of Political Science. 11 (1): 81–104. doi:10.1017/s0007123400002465. JSTOR 193462. ^ a b "A Deadly Iteration". TIME. March 7, 1969. Retrieved April 27, 2008. ^ Skoloff, Brian (March 6, 2003). "Sirhan Sirhan denied parole for 12th time". www.signonsandiego.com. Associated Press. Retrieved April 26, 2008. ^ Murphy, Jarrett (March 7, 2003). "Sirhan Sirhan Kept Behind Bars". CBS News. ^ "Sirhan Sirhan moved to new California prison". San Jose Mercury News. November 23, 2013. ^ "Bullet switch proves Sirhan Sirhan innocent of Robert F Kennedy assassination, claim lawyers". Daily Record. Retrieved December 1, 2011. ^ a b c Mel Ayton (2007). The Forgotten Terrorist – Sirhan Sirhan and the Assassination of Robert F. Kennedy. Potomac Books. pp. 109–110. ISBN 1-5979-7079-4. ^ a b c d "What Was Going On?". TIME. June 14, 1968. Retrieved April 28, 2008. ^ "The Assassination of Robert F. Kennedy ABC News Live Coverage". YouTube. Retrieved December 16, 2018. ^ News, A. B. C. "Video: June 5, 1968: Robert F. Kennedy Dying". ABC News. Archived from the original on February 4, 2011. Retrieved December 16, 2018. ^ West, Andrew (June 5, 1968). "RFK Assassinated". University of Maryland/Library of American Broadcasting. Archived from the original (Audio) on April 26, 2012. Retrieved August 19, 2007. ^ Turner, William; Christian, John (1978). The Assassination of Robert F. Kennedy. New York: Random House. ^ a b "CIA role claim in Kennedy killing". BBC. November 21, 2006. Retrieved April 27, 2008. ^ O'Sullivan, Shane (November 20, 2006). "Did the CIA kill Bobby Kennedy?". The Guardian: 10 / G2. ^ a b c d e Aaronovitch, David (2010). "Conclusion: Bedtime Story". Voodoo Histories: The Role of the Conspiracy Theory in Shaping Modern History. Riverhead Books. ISBN 9781101185216. Retrieved May 31, 2015. ^ a b Randerson, James (February 22, 2008). "New evidence challenges official picture of Kennedy shooting". The Guardian. London. Archived from the original on April 18, 2008. Retrieved April 28, 2008. ^ Noguchi, Thomas (1985). Coroner. New York: Simon & Schuster. ISBN 978-0-671-46772-2. ^ a b "Robert F. Kennedy Assassination Summary, Part 1(b)" (PDF). FBI. p. 35. Retrieved July 25, 2008. ^ "Democracy Now! Special: Robert F. Kennedy's Life and Legacy 40 Years After His Assassination". Democracy Now!. June 5, 2008. Archived from the original on March 18, 2018. ^ O'Sullivan, Shane (2008) Who Killed Bobby? : The Unsolved Murder of Robert Kennedy. New York: Sterling Publishing. p. 478. ^ Harrison, P. (2007) 'Analysis of "The Pruszynski Tape"' (report on recording of gunshots). In Ayton, M., The Forgotten Terrorist: Sirhan Sirhan and the Assassination of Robert F. Kennedy. Washington: Potomac Books. ^ O'Sullivan, Shane (2008) Who Killed Bobby? : The Unsolved Murder of Robert Kennedy. New York: Sterling Publishing. p. 475. ^ Johnson, Brad; Martinez, Michael (March 4, 2012). "Attorneys for RFK convicted killer Sirhan push 'second gunman' argument". CNN. ^ Stempel, Jonathan (January 6, 2015). "Sirhan Sirhan loses bid for freedom over RFK death". Reuters. ^ a b Hoggard, Liz (January 21, 2007). "The night Bobby Kennedy was shot". The Independent on Sunday. ^ "American Rhetoric: Edward Kennedy — Eulogy for Robert F. Kennedy". americanrhetoric.com. Archived from the original on May 9, 2008. Retrieved May 12, 2008. ^ a b "Arlington National Cemetery: Visitor Information". Arlington Cemetery. Archived from the original on May 11, 2008. Retrieved May 12, 2008. ^ Kotz, Nick (2005). "Epilogue: The Legacy". Judgment days: Lyndon Baines Johnson, Martin Luther King Jr., and the laws that changed America. Boston: Houghton Mifflin. p. 422. ISBN 0-618-08825-3. ^ Engler, Mark (January 15, 2010). "Dr. Martin Luther King's Economics: Through Jobs, Freedom". The Nation. Retrieved July 19, 2012. ^ Mossman, B.C. (1991). "XXVIII: Senator Robert F. Kennedy". The Last Salute: Civil and Military Funerals 1921–1969. Washington, D.C.: Department of the Army. Retrieved July 19, 2012. ^ "United States Secret Service History". United States Secret Service. Archived from the original on May 13, 2008. Retrieved May 12, 2008. ^ Smith, Terence (October 29, 2003). "Transcript:Online NewsHour — Deadlines Past". PBS. Archived from the original on March 9, 2007. Retrieved May 18, 2008. ^ Kerridge, Steven (January 27, 2007). "Would Robert Kennedy have been president?". The Guardian. London. Retrieved November 26, 2007. ^ Newfield, Jack (1988). Robert Kennedy: A Memoir (reprint ed.). New York: Penguin Group. pp. 293–294. ISBN 0-452-26064-7. ^ Thomas, Evan (2000). Robert Kennedy: His Life. New York: Simon & Schuster. p. 24. ISBN 978-0-684-83480-1. ^ Schlesinger Jr., Arthur M. (1996). Robert Kennedy and His Times. Ballantine Books. ISBN 0-345-41061-0. ^ Beschloss, Michael (August 11, 1996). "Let's Have Conventions With Cliffhangers". The New York Times. Retrieved May 13, 2008. ^ "Robert F. Kennedy and the 82 Days That Inspired America". History News Network. June 8, 2008. ^ "Busboy describes Bobby Kennedy's final moments". telegraph.co.uk. August 30, 2015. ^ Newfield, Jack (1988). Robert Kennedy: A Memoir (reprint ed.). New York: Penguin Group. p. 394. ISBN 0-452-26064-7. ^ "People in the News". The Week UK. ^ "California State Archives". California Secretary of State. Retrieved September 25, 2012. ^ "RFK Assassination Archives – Claire T. Carney Library – UMass Dartmouth". Lib.umassd.edu. Retrieved December 16, 2018. ^ "About – Claire T. Carney Library – UMass Dartmouth". Lib.umassd.edu. Clarke, Thurston (May 27, 2008). The Last Campaign: Robert F. Kennedy and 82 Days That Inspired America. Macmillan. ISBN 978-0-8050-7792-6. Melanson, Ph.D, Philip H. (June 1, 1991). The Robert F. Kennedy Assassination: New Revelations on the Conspiracy and Cover-Up, 1968–1991. New York: Shapolsky Publishers. ISBN 978-1561713240. Moldea, Dan E. (1995). The Killing of Robert F. Kennedy: An Investigation of Motive, Means, and Opportunity. New York: Norton. ISBN 978-0-393-03791-3. Witcover, Jules (1969). 85 Days: The Last Campaign of Robert Kennedy. New York: Putnam. OCLC 452367.